Many a blogger is sharing memories of the Colony Music Store as it closes its doors after sixty years. Like a lot of people, I only used Colony as a sheet music store, only musical theatre scores. I ignored the memorabilia, records and touristy stuff. And when I say used I don’t really mean shopped. Often, when I needed to know how a song goes, I’d browse Colony’s shelves, take a few glances, and committed the music to memory, well enough for my purposes. So, I guess I’m confessing I availed myself of their fine selection, sans monetary exchange, and so am partially responsible for their demise. In my defense, I can only say I often told singers to shop there, and when I said “Colony has it” I knew, from my many visits. Forty-Ninth and Broadway: damn, that’s convenient. I can also recall trips to the long-defunct Carl Fischer Music Store on Cooper Square. Seemed the middle of nowhere. Of course, today, Cooper Square’s full of fanciful twenty-first century architecture: surfaces and forms so weird they’re barely recognizable as buildings. Quick, Mac: take me back to Broadway and 49th! Ah, yes: The Brill Building. Colony occupied the street level of The Brill Building, which, when you think about it, is genius. In the tiny offices of the upper floors, for a good chunk of the fifties and sixties, many (or maybe most) of America’s most successful songwriters plied their trade. Music publishers would have them under contract, and they pounded out hit after hit. The Brill Building was, essentially, Tin Pan Alley, many years after the publishers left Twenty-Eighth Street, the original Tin Pan Alley. So, in those years, shoppers at Colony could buy a product that had been created just a few floors above. If, like me, you’re a connoisseur of these things, visiting Colony was like visiting Napa Valley. Sure, you could buy the same bottle elsewhere, but here you get something close to the source. The other commercial space in The Brill is empty, feeding my worries about what’s to come. Nearby are two ridiculously large candy stores, one for Hershey products, the other a multi-story monstrosity just for M & Ms. People come from around the world to see Times Square. M & Ms and Hershey are Names They Know. In they flock, never considering that these candies aren’t a New York product and the Twizzlers they buy here are exactly the same as the Twizzlers they can get back home. Times Square, indeed-all of New York, use to attract tourists with the stuff you could only get in New York. Lindy’s cheesecake, Kung fu flicks, Nedicks franks. Hmm: now that I think of it, compared to those, I prefer Twizzlers. But I miss the Mom and Pop shops, the places you could only find in New York, and, most especially, the people who came here because of their interest in things you could find only here. Like a sheet music store with a staff that was particularly knowledgable about show tunes. A friend of mine who likes to support local businesses wherever he goes, says that in Salt Lake City he only patronizes Mom and Mom and Mom and Pop shops. As someone who’s seen the show about a half dozen times, I’m still foggy on what it’s about. But it’s no surprise an Englishwoman would be unfamiliar: The Fantasticks has been extremely popular around the world; the only civilized country that hasn’t embraced it is the United Kingdom. They find it a little hard to swallow, a bit twee. I’ve always found it magical and romantic. The commenter is a very intelligent twenty-something composer. To him, Sondheim’s expressions of love sound hackneyed or unbelievable. To enjoy The Fantasticks, one has to buy into the idea that when people speak love, they’re apt to speak in unrealistic or flowery terms, and certain clichés can be seen as the trappings of humanity: we feel first love the way all others do, and all the generations before us. 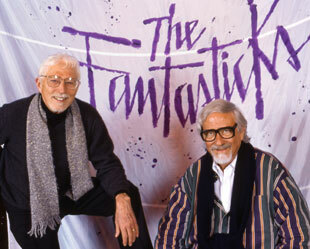 The origins of The Fantasticks are not unlike the origins of West Side Story. The authors wanted to set Romeo and Juliet somewhere more relatable than mid-millennium Verona. Two sons-of-a-preacher-man from Texas set out to write about star-crossed teens in the Lone Star State. Discovering a French play by Edmond Rostand (author of Cyrano de Bergerac), Tom Jones and Harvey Schmidt eventually abandoned the Texas setting. I didn’t have a response for that Jersey shore misapprehension, for the show is set nowhere. And everywhere. I also didn’t have a response to the fellow who felt “Tonight there will be no morning star” rings false. To me, it doesn’t. To me, the Hallmark card lyricism of the libretto is of a piece, used with consistency, and is artful enough to cast a spell. In fact, early on, The Fantasticks asks us to check our cynicism at the door and go back to a time in which nature and the thrill of first love seemed like pure wonder. Try to remember when life was so tender that dreams were kept beside your pillow. That opening imploration, Try to Remember became the hit song that emerged from the score. It’s fair to say most people who see The Fantasticks have heard it before. And the song is so intriguing, the listener wants to know more about the world it lives in. Put differently: many people heard Try to Remember and decided to buy a ticket to The Fantasticks, which is a major part of the reason it became the longest-running musical of all time. The lyric not only describes a different universe, it inhabits one. It not only utilizes false rhymes (remember/tender), it sets up a pattern of using words ending in –low in the place where a rhyme would normally be (pillow/follow). When the show opened in 1960, show tunes simply didn’t do this. It was a shock to the ear. But an even greater shock to the ear is the vocabulary of Harvey Schmidt’s music. 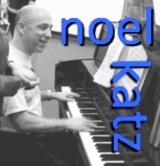 It’s based in contemporary jazz, and what might be called smooth and quasi bluesy piano noodling. It’s scored for piano and harp. It has a harmonic palette that, like Jones’ near-rhymes, hadn’t been heard much in previous musical theatre scores. Go to a piano and play a C major seventh followed by a G minor ninth. The juxtaposition is a little odd, a little unexpected, but satisfying, like a surprising zest of lemon in a vanilla gelato. So, we have a Romeo and Juliet, a bildungsroman, cool jazz, imagery and silly tropes as old as Commedia mixed together. And guess what: the amalgam works incredibly well. I’ll tell you the gold standard for me. If a musical’s going to be about love – and another example is Broadway’s longest runner, The Phantom of the Opera – I want to experience the emotions of love in the theatre. For me, Phantom fails on that score: Raoul and Christine and that self-pitying sunburnt fellow in the mask – I care not a whit for them. But Matt and Luisa, coming together after the petty obstacles placed in their way – that gets to me. They Were You, in my household, is used as a lullaby. Touches me every time, as if I’m again experiencing the discovery the maturing teens from The Fantasticks do. All my wildest dreams multiplied by two: they were you. Whenever I’m in a retrospective frame of mind, considering questions like “What one person had the greatest influence on your life?” or “Who’s the most remarkable individual you ever got to know?” I immediately think of Mr. Ingle. I’m older now than he was the years I knew him and yet I can’t bring myself to call him anything other than Mr. Ingle. It’s a little like calling Queen Elizabeth Lizzie. The respect Mr. Ingle garnered, as a high school drama teacher – you don’t mess with that. And the man was legendary. Audiences would regularly travel miles to see the shows he directed, not knowing a single kid in the cast. Mr. Ingle was the attraction, and they were always fairly fantastic. Or, it’s possible those strangers-to-all-the-students were coming in the hopes of saying “I saw a star before he became famous.” In three decades of teaching high school, nobody taught a higher quantity of future stars. Yvette Mimieux, Stefanie Powers, Barbara Hershey, Julie Kavner, Swoosie Kurtz, Rob Reiner, Albert Brooks, Richard Dreyfuss, Joanna Gleason, Laraine Newman, David Schwimmer and Nicolas Cage, to name just a few. 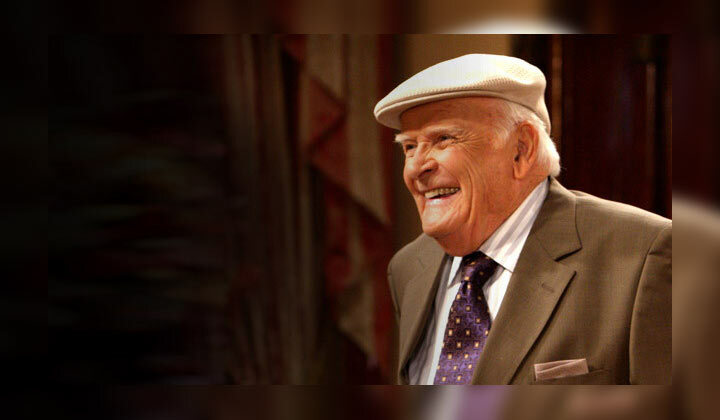 I can vividly recall, while I was feasting on his classes, some newspaper referring to “John Ingle’s talent factory.” You burst with pride to be a part of such a thing. It’s often said that great directors set up a fertile environment in which artists create. The shear quantity of us drama kids, the moths to Mr. Ingle’s flame, is astounding. The spring musical would have more people working on it – mostly behind the scenes – than all our school’s sports programs combined. The sets the kids constructed were so fabulous and of such high quantity, they were rented by other schools for their productions years and years afterwards. The auditorium – enormous in my memory – regularly sold out. Our silver-haired Pied Piper often waxed enthusiastic about the power of theatre, the brilliance of various plays and musicals, and, most emotionally, the talents we possessed. “They’ll be throwing babies from the balconies,” he’d say, despite the fact there was only one balcony and the audience was discouraged from bringing infants. But this was his loving way of predicting we’d be wonderful – a self-fulfilling prophesy – and, above all, we felt loved. Maybe what I’m about to describe is a common cliché, but, at our school, an amazingly high percentage of kids had divorced parents. Year after year, the strong, benevolent father figure we saw, and looked forward to seeing, was Mr. Ingle. Were we drawn to him out of some basic child’s psychological need? It’s more likely, I think, that quality was the draw: we saw the shows and instantly wanted to be a part of his team. And we’d work our asses off in his classes and rehearsals. I think back on the other classes I took, mostly honors courses, and the other fine teachers I had: Did I work nearly as hard in any other subject? Not close. As you know if you’ve read me before, I’m all about the writing of musicals. In Mr. Ingle’s musical theatre workshop, in studying what it takes to perform in musicals, I learned more about what it takes to write musicals than from any other single source. It was knowledge I couldn’t wait to apply. So, while in high school, I wrote three musicals, and pitched two of them to Mr. Ingle for possible production there. In Room 181, where we’d all hang out, right outside of his office, I played the entire score to The Great White Way and Through the Wardrobe for an audience of one: Mr. Ingle. He took me seriously. He asked the sorts of questions any producer might ask if they were giving a property serious consideration. In a story I’ll tell some other day, most of the script to Through the Wardrobe had been written in Room 181, on a non-electric typewriter. My collaborator and I sat there holding hands as Mr. Ingle announced the summer shows. He’d opted for You’re a Good Man, Charlie Brown instead. I thought “Well, that’s a good one, too.” That we were even in the running, in his eyes, was affirmation enough for me to continue writing these things. And the next thing I knew, my collaborator got Through the Wardrobe produced in England. A couple of years after my sister excelled her way through the Ingle Performing Arts Department, the numbskulls on the School Board decided it was time to put the fifty-something stud horse out to pasture. (They could pay a younger teacher less.) So, with time on his hands, Mr. Ingle started going to auditions. Soon, he was getting tiny roles in films and TV. The roles got bigger, bit by bit, until he was cast as Edward Quartermaine on the popular soap opera, General Hospital. Suddenly, he was extremely famous for his thespian abilities. 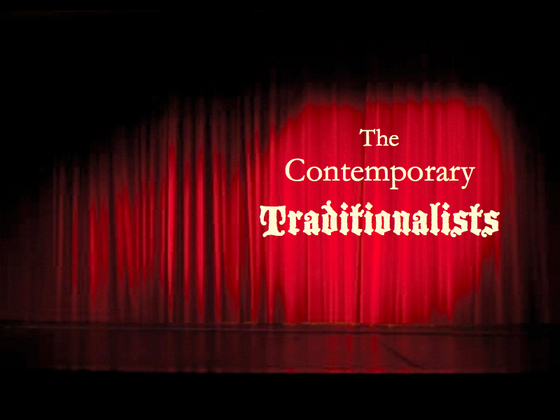 Last night I caught a cabaret concert by an organization called The Contemporary Traditionalists. Last year, I had a couple of songs in a similar concert they did, featuring world premiere performances of material from new musicals. I must say, this more recent show was a step in the right direction. Most of the songs were effective comic pieces, and just about all of them seemed influenced by great musical theatre songs of the past. This is a really good thing. It’s been my observation that the lion’s share of contemporary musical theatre writing appears to have been wholly uninfluenced by what I’ll awkwardly call the Show Tune Tradition. Songs, at all levels of quality and exposure, resemble some of the quirkier pop songs of our time, rather than songs-from-musicals. There’s something odd, and perhaps self-defeating, about creating songs-for-musicals that don’t sound anything like previous songs-from-musicals. Are writers of show tunes today expressing a disdain for the show tunes of yesterday? It seems plausible that some of these upstarts are unfamiliar with our heritage. Obviously, they’re familiar with contemporary pop. I’ve seen “Ben Folds-y groove” written over the first bars of sheet music. I’ve never seen “Jule Styne-ish build” written anywhere. They write what they know. It makes me think it would be nice if BMI’s Lehman Engel Musical Theatre Writing Workshop required participants to learn the repertoire. And how hard would it be to familiarize oneself? Many of the great shows of the 40s, 50s and 60s are still produced regularly around the country. Outside of She Loves Me and The Most Happy Fella, most of the really good ones have film versions. From my perspective, you’ve got to have your head in the sand to not be aware of our Show Tune Tradition. Note how the staging adds drama with an awful lot of shtick. The director has wisely compensated for a distinct lack of drama in the song. The poor would-be bride states her desire, and then states it again, and again, repeating some of the same lyrics. Just like pop songs do. Just like good theatre songs don’t. Look at it this way: If you were writing a monologue for this character to express at this moment in the play, would you feel a need to have her say “Someday when it’s me I’ll know our love was meant to be. Not one single complication or cause for hesitation. Someday when the dream is coming true, all you’ll need is me and all I’ll need is you” three times? Seems like a bit of overkill, no? But we’re used to repetition in songs, especially pop songs, and this mindless iteration is somehow acceptable. So here’s the good news: Eight songwriters last night eschewed pop clichés and vacuous repetition. (Andre Catrini, Chris Fitz, James Harvey, Omri Schein & James Olmstead, Michael Shapiro & David Christensen, Keith Varney) In so doing, they created amusing musical theatre pieces. They sounded like the output of young writers who are very aware of the fine Show Tune Tradition. And that’s why the producing outfit’s title, The Contemporary Traditionalists, seemed so apt. The focus was on comic turns, such as Ashley Brooke as the world’s most ambitious girl scout and Brad Siebeking bidding goodbye to an unwanted organ. Oh, how we laughed. For last year’s concert at The Broadway Comedy Club, the program had a higher percentage of rapturous ballads, such as my own Miracle and Teach Me How To Love. In retrospect, I think they might have been hoping I’d instead give them a couple of comedy songs (I seem to be known for that). But, since they asked for recently-written stuff from a current project, and I like my ballads better than the gag numbers on that one, I saddled them with Miracle, which is introspective and haunting, not funny. I apologize. But, I’m proud to state – using lower case letters – that I am a contemporary traditionalist. What rolls around in my head, all the time, are show tunes, from musicals new and old. You’re unlikely to hear me humming Call Me Maybe, although, when I see cars illegally blocking crosswalks, and I’m pushing my baby in a stroller, a certain CeeLo Green hit comes to mind. I’ve heard some talk. They say you think I’m fine. I can hardly wait to hold you, feel my arms around you. A chair is still a chair even when there’s no one sitting there. Without true love we just exist. Foolish pride, that’s all that I have left. Go while the going is good. Things that I promised myself fell apart, but I found my heart. And this got me to thinking: there really are a lot of Hal David lyrics I really admire. David’s was a star that shone brightly for just a few years. Incredibly successful, but not for all that long. And the hits came with composer Burt Bacharach, who was then and now a huge influence on me. What I love most about these songs is the set of jaunty jazzy harmonies in the music, but along with that came quite a number of jagged rhythms. And you have to be some sort of a genius to put words to such oddities that will somehow be singable, and sensible. Now, David’s lyrics didn’t always make sense to me, but now that I consider the Sisyphean task of matching Bacharach’s music, well, it’s something of a miracle they made sense as often as they did. You buy two, and it costs less. Can we be living in a world made of paper mache? Everything is clean and so neat. Anything that’s wrong can be just swept away. Spray it with cologne, and the whole world smells sweet. I don’t know what the hell that means. And I don’t much care: it sounds pretty, which is just what a good pop tune should do. Now that we’re considering what it must be like to have one’s worth co-exist with some really attention-grabbing music, what about an attention-grabbing script? Neil Simon’s book for the musicalization of The Apartment, Promises Promises, is less like a musical and more like a stand-up comedy act. A corporate schnook addresses the audience, and the things he has to say are really, really funny. And then it’s time for a song. To be the lyricist in that situation is very difficult, especially if comedy songs are not your forte and you’ve never written musical theatre before. I don’t think David’s lyrics to the show are nearly as good as his collaborators’ contributions, but they’re not so bad they stopped the show from being a huge hit. He did a decent job at something that must have been extremely challenging. The origin of that project is a tale worth telling. Neil Simon had had hit after hit on Broadway, and gets a call from infamous producer David Merrick inviting him to lunch. Everyone who knew Simon told him to stay away, but the good doctor felt there was no harm in just having a meal with the mustached man. Merrick was surprisingly charming, and when he got to business, he said “What if I got the rights to do The Apartment as a musical, who would you want to write it with?” And Simon thought to himself “There’s no way David Merrick will ever get the rights to The Apartment; it’s an Academy Award-winning picture, and the studio will never let it be put on the stage.” (How times were different then.) Pressed for an answer, Simon blurted out “Burt Bacharach and Hal David” who, at the time, had several songs on the Top 40. They were at the height of their popularity, and Simon knew there was no way they’d leave the lucrative film scoring work to waste time on a stage musical. He might as well have named Mozart, there was no way Merrick was going to get them. Except Merrick did, and then Simon had to go through with it, and that’s how a hit show was born. Today, we often say, rather reflexively, that musicals based on movies are always bad ideas. It’s only true if you have no sense of history, like most people today. Something I can remember from many years ago is when the city of Los Angeles was suffering from sort of inferiority complex: There were many great songs about New York, a couple of really good ones about Chicago, and of course New Orleans. L.A. seemed the unsung city. So they held all sorts of contests, and tried to interest top songsmiths in writing about the place. Randy Newman wrote a spoof, which contains the brilliant line “It’s got Century Boulevard.” Century Boulevard, which leads to the airport, has no particularly character at all. Compare “On State Street, that great street” in the song about Chicago. But the real reason nobody could come up with a song that really captured Los Angeles is that Hal David (with Bacharach) had already done it, in a song with a different California city in its title. What lines sum up the place better than these? Are parking cars and pumping gas. Whoa whoa whoa whoa whoa whoa whoa whoa, that’s good. Rest in peace, Hal David. How hard Joy works. Three months ago, she started her own casting company, and she’s already done some major off-Broadway musicals and the soon-to-launch national tour of Catch Me If You Can (look for it in a city near you). All this hard work takes time away from Adelaide, and I’m the lucky one since I get the lion’s share of time with the baby. Casting can be very challenging work. 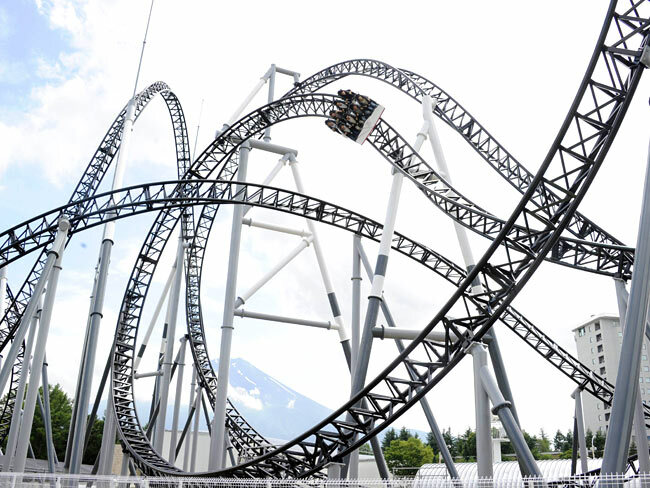 Clients sometimes come to projects with unrealistic expectations. Gazing at our beautiful child, I see, attached to the stroller, a luggage tag from the 2007-2008 national tour of Movin’ Out, the first big project Joy ever cast. The director, internationally esteemed choreographer Twyla Tharp, was used to getting the crème de la crème, but this particular tour had an arduous schedule and a not-all-that-attractive salary. Many of the dancers with the proficiency to perform this difficult narrative ballet were saying no to this gig. Joy’s job was to find the folk who’d say yes. That meant, first, that Joy had to educate herself about dance; it hadn’t previously been her area of expertise. Then, she had to go out and find a wide array of talent, and put it in front if Twyla. What strikes me as most remarkable, all these years later, is that Joy got Tharp to adjust her expectations, to see diamonds in the rough: where she was used to crème de la crème, she learned to embrace la crème du reste. And was quite pleased with the results. Show up at the open call and out-audition everyone else. That’s the way it’s done. It’s your agent’s job to get you work, not the casting director’s. It’s likely you don’t see yourself the way the world sees you, especially when it comes to role appropriateness. And the casting director can become the lightning rod for blame. Once, I ran into a friend of mine, right as she was on line to audition for something. Across the hall, Joy was casting something my friend would have been perfect for. Or so I thought. The client, it turns out, was insisting on a very specific physical type which my friend didn’t fit. But how would she know that? Sometimes, a casting director’s hands are tied. Lest we jump to the conclusion that this client was being unreasonable, let me air some dirty linen of my own. There was a character in Area 51 who had to be laid-back, personable, copacetic and friendly. Oh, and he hails from another planet. We saw a lot of fine actors for the role but one stood head and shoulders above the rest. Literally. Gregory Jones is six-foot-six. Paint him green (as we did) and he’s bound to look like a brother from another planet. No mere human-size human would do for us. Greg was wonderful as the alien, and I’m pleased to report he made his Broadway debut last spring in a play about NBA stars. And then there was an incredible array of specifications for the lead of Such Good Friends. The character is a big comedy star in the early days of television, so someone like Lucille Ball or Imogene Coca. The script contains a flashback to an early point in her career, so the actress would have to pass for 21-or-thereabouts to 38-or-thereabouts. I wanted to make a subtle point about the anti-semitism of blacklisting, so, ideally, the character should be Jewish. But not like Gertrude Berg – the point would cease to be subtle. The singing demands were huge (critics compared it to Funny Girl) and, above all, she had to be lovable. Sounds impossible, doesn’t it? Luckily, Joy’s company was on the case. Agents pushed various people – some big names, but none that matched our needs. Since we were part of The New York Theatre Festival, there was, contractually, a severely limited amount of salary that we were allowed to offer. (Also, a limited rehearsal period.) Actors’ availability and willingness was checked. We sat through roughly 300 auditions. And finally, credit a save to the casting director: We got Liz Larsen. I’d seen her in A New Brain, Starmites, and The Most Happy Fella, but somehow didn’t think of her. That’s because I don’t have the brains to work in casting. While The Most Happy Fella earned her a Tony nomination, Such Good Friends earned Liz two impressive awards: one from NYMF and a performance-of-the-year honor from Talkin’ Broadway, in addition to a whole bunch of raves. She was absolutely riveting in the role: no one else would have been nearly as good. Area 51 didn’t have a casting director; some of those players never appeared in a New York musical again. Such Good Friends taught me that trying to cast without a professional (like Joy Dewing) is the height of foolishness and hubris. Trust me, you don’t want to go through the casting process alone. And I know, I know: it’s a little harder to trust a husband, but you couldn’t find a better casting director than Joy. You are currently browsing the There's Gotta Be a Song blog archives for September, 2012.